Posted on January 28, 2014 by Warin	in CNN, interview, media, New Jersey, Richard Sherman, Seattle, Sports, Super Bowl, thug. Richard Sherman sure was hyped following the NFC Championship Game last weekend. The post rant fallout hasn’t been nearly as fun however. In the last couple of years the loquacious cornerback, Sherman, has gained a bit of a reputation for getting in to people’s faces and not being afraid to make a point. He did it to Tom Brady. He did it to offensive tackle Trent Williams and received a parting shot by way of a right hook. Neither of these two previous episodes received the attention of Sherman’s latest post game faux pas. Here’s the video for those who might have missed it. As you can see, Sherman is clearly excited and maybe just a tad vindictive towards 49ers wide receiver Michael Crabtree. The reporter, Erin Andrews, is clearly caught off guard. I must admit when I first saw the interview as it was happening, my first thought was, “This guy sure is mad.” Then I thought about it more and remembered this man literally just made the game saving play against a guy who he feels slighted him in the past. Oh, and that play is one of the key reasons why the Seahawks are going to their second Super Bowl in the last 8 years. In the days following the interview, the condemnation was swift.There were those who said Sherman was classless, a poor example of sportsmanship, and showed firsthand what not to do in a post-game interview. There were also those that used code words like ‘thug’ to describe Sherman’s antics. Some on social media even went as far as to refer to Sherman as a monkey. 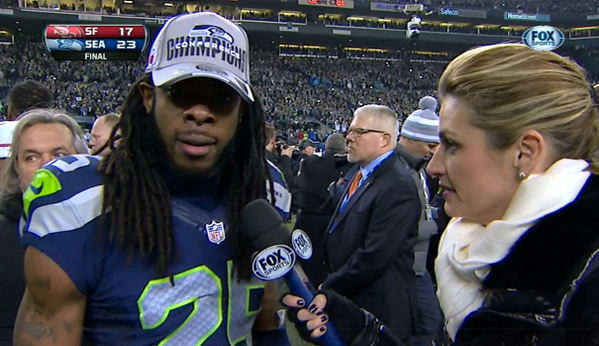 Clearly, Sherman probably could have handled the post-game interview better, and he has since admitted as much. However, I think we have to remember that he was interviewed moments after he made the biggest play in the game, at home, and that he sealed his team’s trip to the Super Bowl in New Jersey (yes, New Jersey). So to not expect him to be hyped and animated isn’t exactly fair. We want our athletes to be motivated, animated, and using whatever slights against them (real or imagined) to up their game even more to perform at the highest level. You can’t expect guys to be making tackles, taking hits, putting hats on people, and then get mad when they may not show the best decorum in a post-game interview. I have no problem with people who criticized Sherman’s rant for him going after Crabtree. But calling a man a thug (this so called thug also happens to be a Stanford grad) just based off nothing more than his appearance and an interview, reveals a lot more about some of Sherman’s critics than it does Sherman. Stay classy, folks.